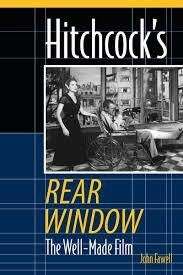 I first became aware of John Fawell when I purchased Rear Window on blu ray. It is Fawell’s erudite and entertaining commentary track that appears as one of the bonus features. This book explores many of the same themes addressed in the commentary track, but in greater depth. What sets this book apart from most other Hitchcock books focused on one film is that this is not a nuts and bolts “making of” book. If you are interested in learning which scenes were shot on which day, this is not the book for you. Fawell focuses exclusively on themes and ideas. He references many works that preceeded him, while putting forth many of his own ideas as well. It is clear that Fawell is not just a professor, but a fan as well. He is someone who has watched this movie, and thought about it, many times. The chapters are broken down into different thematic elements. Perhaps the most enlightening for me are the sections on the soundtrack. The visuals of Rear Window are so powerful and entertaining that one can easily miss some of the background music and sounds. I think Rear Window has one of the greatest diegetic soundtracks ever constructed, and Fawell gives this subject the time and attention it deserves. Fawell also examines each of the characters who Jeff watches from his window, looking at what they represent thematically. He has a chapter focused on loneliness, another on Jeff’s emasculation, and another on the subject of Jeff as Hitchcock. He also focuses on the brief instances when Hitchcock takes us outside Jeff’s point of view. Again, Fawell provides the best insight yet recorded on this aspect of the film. This book is a treasure trove of ideas for anyone who is a fan of this movie, and wants to dig a little deeper into the possible meaning and subtext. I would recommend giving Fawell’s excellent commentary track on the blu ray a try first. It is very engaging and full of ideas. If you enjoy that, and want a deeper dive into some of those themes, then the book is highly recommended.